The mute cancels and mute registration used at the beginning of World War I are one of the least known and studied areas of Russian philately. 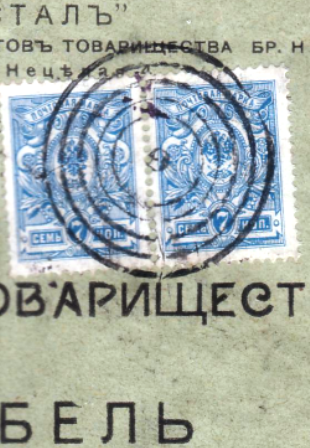 Just as the war started, unusual postmarks began to appear on mail originating from many Russian cities and towns. They were unusual in that they contained no indication of the originating post office, nor did they show a date; this led to their being called "mute" cancels. Registration labels and markings that failed to show the originating post offices also appeared during that period; they are termed "mute" registrations. With time it became apparent that with mute-cancel and mute-registration mail were coming from strategic areas, as defined by the military. The use of these cancels and registrations were justified by the apparent need for military secrecy; the date stamps and town names on captured mail, when coupled with the content of the letters, could give the enemy important information. Even the place names on registration labels were excised. Mute cancels and mute registration were used for a very brief period, primarily in August and September 1914, with a period of decline in October and November of that year. Later, mute cancels continued in use at some post offices that had lost their standard cancellers due to the war, i.e., in areas that had changed hands several times. In 1916-1917, several POs (e.g. Petrograd and Smolensk) used cancels with the date only, lacking any place name. No official Postal Administration directives requiring the use of mute cancels and registration have been found; official start and end dates are unknown. There are also no documents that equate any mute cancels (which came in a wide variety of designs) with the post offices that used them. Each post office devised its own mute cancels and they abbreviated or replaced the registration labels with handwritten entries, making identification difficult. The exhibitor equated most of the mute cancels and registrations shown here with the place of their origin by correlating the altered registration labels with the standard ones. Another method of identification was possible due to postal officials who continued to use registration labels with the post office's name intact. Other clues were gleaned from the messages on postcards and the texts of letters that were not properly censored, but the primary .means of identification came from the return addresses printed on commercial correspondence. This exhibit will show mute cancels and mute registration from many locations, describe the characteristics of the mail, and note the dates of dispatch and receipt in order to establish the duration of use. It will also demonstrate the factors used to identify their points of origin, employing standard date stamps, registration labels (or hand stamps) and types thereof, the texts of the messages, censor marks and return addresses. It shows that mute cancels were used at several post offices for only one and a half months and standard date stamps were re-introduced from the 1Oth to the 15th of September, 1914 (Vindava-11; Warsaw-12; Riga-14; Kiev-15).